I've discussed ventilation for toilets and tube stations, but can't forget the sewage 'stench pipes' which also adorn our streets. Believe it or not, I'm not using the word 'adorn' sarcastically: some examples are even listed. 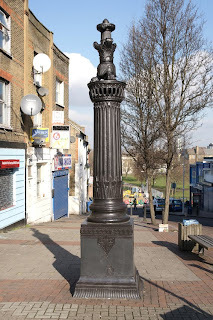 There's a stink pipe on Watson's Street, Deptford which has a moderately ornate base topped by a long, slender and plain pipe. 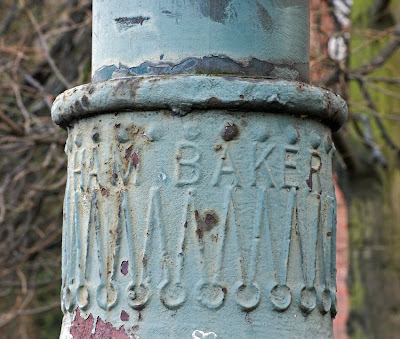 It's pretty typical of the Victorian work of its manufacturer, Ham Baker. Indeed, this particular design seems to have been popular: Faded London has a very similar pipe in Jamaica Road. Ham Baker are now based in the Midlands but some of their older metalwork calls them 'Ham Baker, Westminster'. Indeed, Frederic Ham was listed in 1905 as a member of the Institution of Mechanical Engineers; his firm's address was 13 Grosvenor Road, Westminster. They also made all sorts of other items including fire hydrants and manhole covers; still in existence today, they now specialise in "innovative products for the water and waste water markets", so the sewage aspects of the business seem to have stuck! What was the purpose of such pipes? They offered an escape route for built-up gases, particularly hydrogen sulphide gas which was corrosive and could otherwise damage the sewers. (Again, Faded London has more information.) This was particularly important where the sewage was travelling long distances or the flow was slow. However, vital as venting the gases might be, nobody wanted to smell them as they escaped: hence the great height of these pipes. Given their mundane, even unappetising, role it's a tribute to the nineteenth-century appreciation of engineering that these pipes nonetheless enjoy some ornamentation. 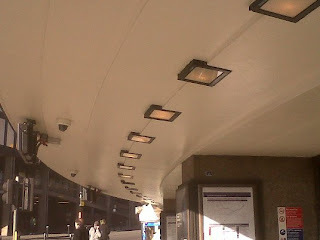 Although disregarded or mistaken for broken lamp posts, they are in their quiet way monuments to Victorian civic pride. However, I was certainly distracted from my symptoms by an intriguing project: the leech barometer. Yes, using real leeches. Take a two-ounce phial three-parts filled with pure water, and place in it a healthy leech, cover the mouth of the bottle with a piece of muslin, and it will most accurately prognosticate the weather. If the weather is to be fine, the leech lies motionless at the bottom of the glass, and coiled together in a spiral form; if rain may be expected, it will creep up to the top of its lodgings, and remain there till the weather is settled; if we are to have wind, it will move through its habitation with amazing swiftness, and seldom goes to rest till it begins to blow hard; if a remarkable storm of thunder and rain is to succeed, it will lodge for some days before almost continually out of the water, and discover great uneasiness in violent throes and convulsive-like motions; in frost as in clear summer-like weather it lies constantly at the bottom; and in snow as in rainy weather it pitches its dwelling in the very mouth of the phial. The water should be changed weekly in summer and fortnightly in winter. Among the most unnoticed or misunderstood pieces of street furniture, ventilation pipes are often not recognised by most passers-by. Indeed, sometimes careful efforts are made to disguise them. 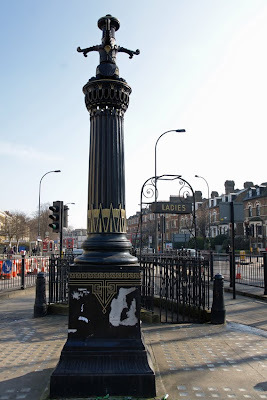 One of the best-known local examples is the former ventilation pipe for the underground toilets on the Kender Triangle, New Cross Road. For all its fresh paint and prominent position, this combined pipe and lampstand looks rather adrift. The toilets have been filled in and the light fitting which once topped the pipe has gone. It is in every sense redundant. However, the story is likely to have a happy ending. As Transpontine explains, the pipe was listed thanks to the efforts of historian Jess Steele and others. It is special not only for its dual purpose and attractive design, but also because it is the only work of architect Alexander 'Greek' Thomson to survive in England, along with its sibling further east in Clifton Rise. Both come from Walter Macfarlane & Co's Saracen Foundry in Glasgow, which we've previously met as a maker of bandstands and fountains. The second example also used to ventilate public toilets, now long gone, and both were installed in 1897. Even more cunningly disguised ventilation can be found in the statue of James Henry Greathead, on Cornhill. He deserves a post in his own right, but for the moment we're just concerned with the plinth. It's carefully shaped to fit the limited plot available, and with space at such a premium here in the heart of the City, it has been made to serve a double purpose. Ventilation is provided for Bank station below, thanks to the plinth being a pipe with air vents in the statue's iron base. Greathead, as an engineer himself, would probably have approved the ingenuity. 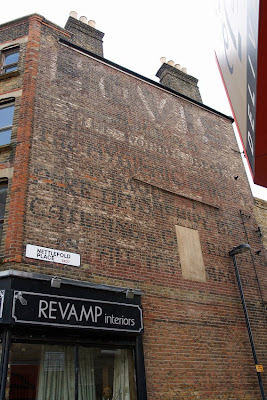 There are two large ghost signs visible on Norwood Road. 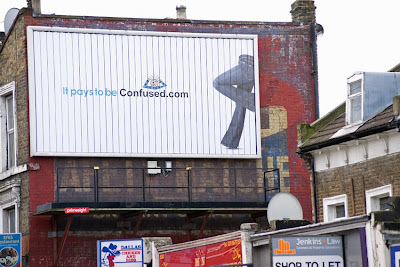 Unfortunately, the first has been obscured by a hoarding: you have to stand underneath and peep up to see the full brand name. Enough is visible around the edges of the modern interloper to get a good idea of how the brick ad looks: 'BRYMAY' in a yellow oval with 'safety matches' underneath. There are similar designs elsewhere. Less obscured but more faded is an advert for 'Hovis bread, the world's best'. It's not easy to decipher the writing below, which following usual Hovis practice is extolling a local bakery. I have made out 'The Hygienic Bakery ?famous for pure Devonshire bread, catering & ... in all its ....' The idea of Devonshire bread as especially pure or desirable is not one I've come across before. 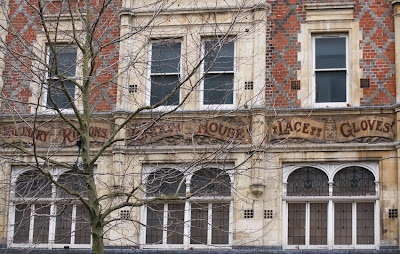 More famed for its post-war buildings, Croydon also boasts some Victorian gems. That's not really surprising: the town had become something of a transport hub at the beginning of the nineteenth century, first as a stagecoach halt for those travelling to fashionable Brighton and then thanks to the Croydon branch of the Grand Surrey Canal, later reused for a railway line. 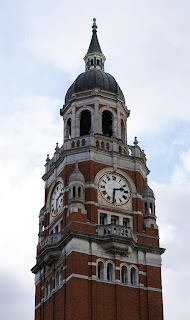 Only minutes by train from central London, Croydon was popular with Victorian commuters as well as a growing industrial centre in its own right. Panels illustrate Health, Recreation, Study, Religion and Music. Ornamental Passions has much more information about the building's decoration here. I particularly liked Health's focus upon clean water and sewage: Croydon formed its Board of Health as early as 1849 and was the first town to install an integrated water supply and sewage system in 1851 (not altogether successfully, as several typhoid outbreaks followed). 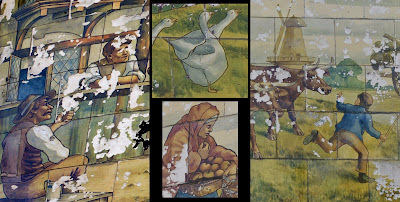 Eighteen months ago, I discussed the tiled mural on the former Kentish Drovers pub, Old Kent Road. The building is Victorian, and since a 1911 book, Old Country Inns of England, refers to it as 'the largest sign we have ever come across' and one of a diminishing number of such pictorial signs, it seems reasonable to assume the sign is nineteenth-century too. Yesterday I took some better photos of the mural. I was intrigued to notice a detail in the bottom right corner: a name, presumably the artist's. Unfortunately the surname cannot fully be made out. It begins 'Alice Da...' but the rest has been obliterated. 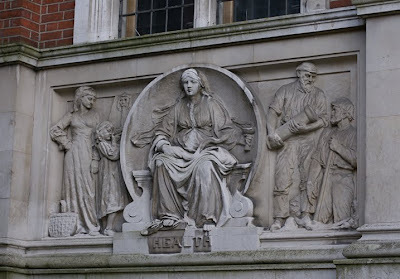 Neither Google nor Pevsner have been able to help, but I'd be intrigued to know who this Victorian artist was. Tiled panels were popular adornments for commercial premises. Among their makers were local company Doulton, who had a factory in Lambeth and employed many women artists in the nineteenth century, as a contemporary watercolour records. Indeed, this pattern was common throughout the pottery industry and in 1861, nearly a third of the workforce in the Staffordshire potteries was female - rising to almost half by the end of the century. Whatever the origins of these particular tiles, they are rich with appealing details. It's a real pity that their condition has been allowed to deterioriate so badly. Deptford history blogs seem to be blossoming at the moment - a term particularly apt for the newest. London's Lost Garden will be telling the story of Sayes Court, once home of John Evelyn. Its first post takes us to the present Sayes Court Park and whets our appetites for the past about to be dug up. 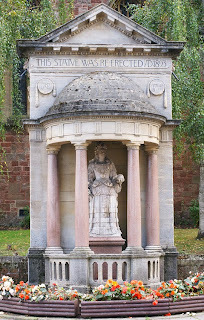 Yesterday I asked how Minehead’s statue of Queen Anne is connected to London. The answer is that its sculptor, Francis Bird, also sculpted another statue of the Queen to stand outside St Paul’s Cathedral. Indeed, it was after seeing the London statue that Bancks was inspired to commission one for his own town. Have lots of bonus points if you knew that Francis Bird was also a protegé of Grinling Gibbons, the Deptford boy made good! He had trained in Europe, and went on to become a leading British baroque sculptor who did a great deal of work on St Paul's Cathedral - as well as a dealer in marble. Back in the eighteenth century, Minehead had under 2,000 inhabitants but two MPs. One of these, Sir Jacob Bancks, presented this statue of Queen Anne to the town in 1719 (several years after he left Parliament). It originally stood in the parish church but was moved to its current location in 1893 under a canopy built specially for it. Despite his strong connections to Minehead, Bancks's estates were at Milton Abbas in Dorset and Hall Place in Berkshire. 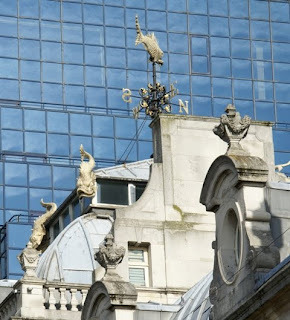 However, the statue has a strong London connection - what is it? 'Where have you sprung from?' inquires Mr Guppy. Jobling looks hungry, and also has the appearance of having run to seed in the market-gardens down by Deptford. For this week only, Wordsmith's words of the day have a distinctly London theme. Each will be a London place which has also become a word. Today's is 'billingsgate', meaning 'vulgar, abusive language'. Interestingly, the example of its usage is modern and American. I'm certainly more familiar with another expression which apparently owes its origin to the fish market - the idea of talking 'like a fishwife'. Any ideas what the next four words might be? On Friday it was buses; today, here's a train. This shiny new East London Line/London Overground train has been in New Cross Station a few times now, including on Friday morning. It's not taking on passengers yet, but hopefully is a sign that the promised imminent opening really is on its way! As Wednesday's film shows, the inscription of dates on buildings has been a common practice. (Also a potentially misleading one: the dates can refer to renovation or remodelling rather than the original construction.) 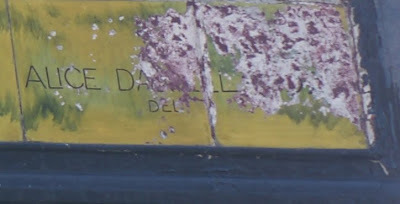 Sometimes initials are added, and they can provide further clues to the building's past. However, many Paris facades have more detailed information neatly inscribed on them: not only the date of the building, but also the name of the architect. The example above (at 18, rue de la Rochefoucauld) is not untypical, and although rather less decorative than many of its English counterparts, is certainly more informative. A view of the whole facade is below. 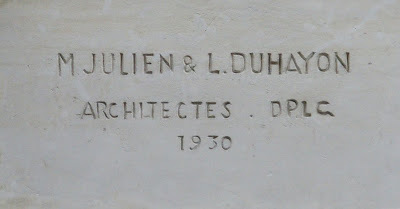 Louis Duhayon and Marcel Julien were associates who also worked together on the Arcades des Champs Elysées, now known as the Arcades du Lido. One of Paris's fine covered passages, this work is also in Art Deco style. It was built rather later than most passages; indeed the nineteenth-century enthusiasm for shopping in these glass-covered spaces had passed, hence the naming of this one as an arcade to distance itself from those old-fashioned predecessors. Styling it in the latest architectural fashion must have helped! A random bit of local information: London Reconnections has linked to a map of proposed Lewisham locations for the new bus information service. It looks like my local bus stop may be included, which is great - but what a shame that huge numbers of bus stops, especially to the north of Deptford High Street, are to be left out. Here are two and a half centuries' worth of dates inscribed on buildings and bridges - and it's more decorative and varied than that may sound. The video is a new, improved version of one I posted on here some time ago - now with locations and, hopefully, improved picture quality. Enjoy! 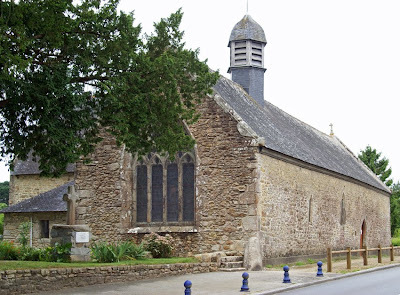 Branderion, a Breton village, has as its protector Saint Anne. She even has a nickname here: Santez Anna Gouh, or St Anne the Elder. Apt, because Branderion's chapel is claimed to be the oldest dedicated to her, with remains dating back to the 9th century, although the present building is mostly from the 14th. 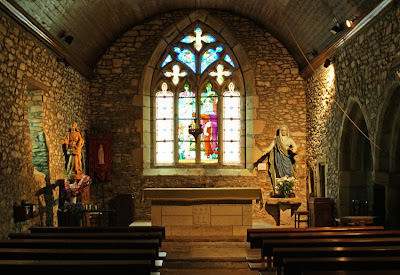 There are two statues of Saint Anne in the simple chapel. One is of stone, but this more striking one is painted wood. It's also notable that she has a strong, mature face, in contrast to the insipid features of many such statues (the stone one in the same chapel is a good example). According to a notice alongside it, the statue was sculpted in the eighteenth century in accordance with a vow made by Compagnie des Indes sailors shortly after their arrival at Lorient. That would make sense since she is, among other things, patron saint of shipwrecks. 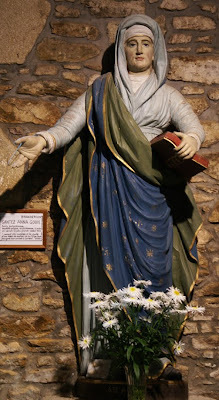 St Anne - grandmother of Christ - has special significance for the Bretons, and is Brittany's patron saint. There are even legends suggesting (improbably!) that she was born in the region. In the seventeenth century, she famously appeared to the peasant Yves Nicolazic in a village since renamed Saint-Anne-d'Auray. He went on to dig up a statue of the saint, and a chapel was constructed on the site under his direction. Although Saint-Anne-d'Auray is not far from Branderion, and has somewhat overshadowed its own connections to the saint, the village must nonetheless be pleased to have the earlier claim. Here's an interesting short film from Goldsmith's student Charlotte Harrison. She has recorded a series of speakers, using their voices not only as the soundtrack to this video but also to be transformed into 3D foam cutouts. Even if you're not interested in accents, the film has plenty of images of Deptford market. Thanks to the comments on yesterday's post, I discovered the Deptford-born tenor and between-the-wars opera star, Heddle Nash. He was born in Amersham Vale in 1894, son of a master builder who was also a talented singer. Nash went on to a glittering career, by the end of which he was Professor of Singing at the Royal College of Music, and died in 1961. Nash was already training in music when the First World War broke out: he sang in the Westminster Abbey choir and won a scolarship to Blackheath Conservatory. Although military service interruped that training, it also brought him together with his wife, a nurse who cared for him after he was wounded. When the war was over, Nash's musical education resumed at Blackheath Conservatory and then in Italy. He made his operatic debut in Milan in 1924, before returning to London. From 1929 to the Second World War, Nash performed regularly at Covent Garden. He also sang at early Glyndebourne Festivals and performed oratorios; he was one of the 'sixteen soloists' who performed Vaughan Williams' Serenade to Music, a tribute to Sir Henry J Wood. His last public performance was only months before his death. Nash lived for the last thirty years of his life in Petts Wood, where a plaque commemorates his life. Deptford, by contrast, makes nothing of this successful son: ironically, Elgar and Vaughan Williams are remembered in Close names, but there is no Heddle Nash Close to be found. This is really just idle curiosity, but I'm hoping someone might know the answer! While Margaret McMillan Park is closed, getting to Deptford High Street involves a diversion past Vaughan Williams Close. Googling doesn't throw up any significant links between Vaughan Williams and Deptford, and the Close doesn't appear to be surrounded by other composer-themed streets. Does anybody have any idea, then, why it has been given this name? Before my trip north yesterday, I'd gone west to Richmond on Sunday. 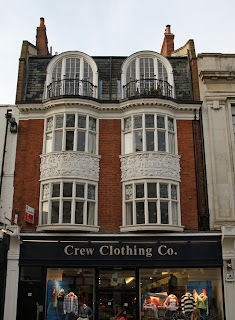 There, this ornate facade in George Street caught my eye. Unfortunately, as it's close to a larger, better known York House, finding anything out about it proved rather difficult! This version may not be as old or aristocratic as its big sister, now town hall for Richmond Upon Thames. However, its fine windows, stained glass and elaborate plasterwork are definitely worth appreciation in their own right. 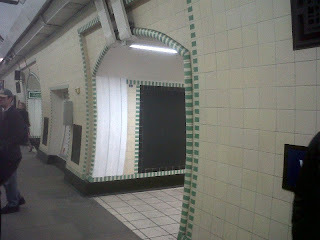 On an unexpected trip to Wood Green, I noticed two things: first, the details of the station decor and second, that I had forgotten my camera. Apologies, then, for the poor quality of the pictures which were taken with my phone. 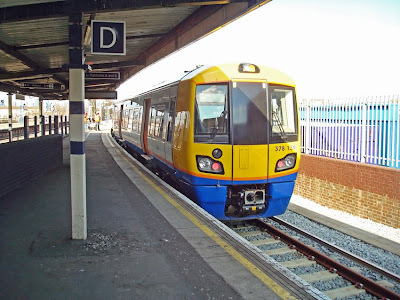 Wood Green and its neighbouring stations are recognised as among the finest on the network. 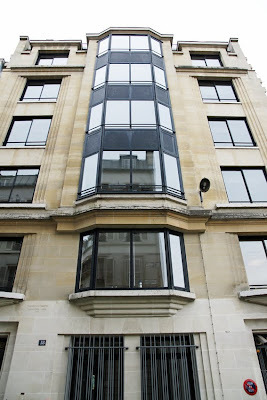 It was designed by Charles Holden, also responsible for 55 Broadway above St James's Park station. 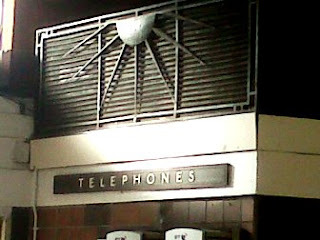 Opened in 1932, Wood Green has a curving brick facade and some details such as this 'telephones' sign which are very much of that period. 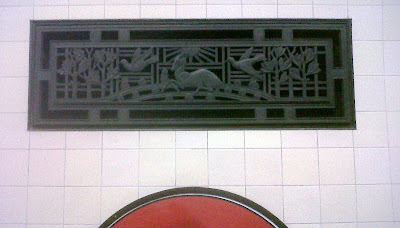 There are also less obvious details, such as the animals sat above eye level in the ticket hall and the wonderfully detailed vent covers. The details, though, are part of a larger design which also pleases. The candy-cane edging to platform entrances are a particularly nice touch. I've no doubt I'll be in Wood Green again at some point; I just hope that next time, I've remembered my camera!